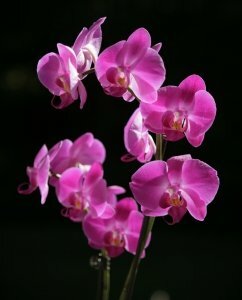 Most people are introduced to orchids through Phalaenopsis orchids that have become one of America's favorite. They have thick-leaved plants with elegant, arching sprays of blooms and have been made even more popular when they are seen in many design magazines sitting on coffee tables. The plants are native to the tropical islands of Southeast Asia. These plants have been extensively hybridized, ranging from the classic white hybrid (often called a moth orchid) to jewel-like miniatures with clouds of yellow and candy pink blooms. No other orchid is better suited to home orchid growing. They are inexpensive and readily available. They are a delightful addition to a home or office. The care of this orchid is simple with modest light and consistent moisture. The main flowering season lasts for months from late winter into spring. They will also re-bloom sooner than other varieties. Phalaenopsis orchids typically bloom in the late winter or early spring. Their long-lasting flowers are held on arching branches and open successively. A single multi-branching flower spike can have more than 20 flowers. When the last flower drops, cut your flower spike back. Continue caring for it and it will re-bloom. To cut the orchid spike back, look for a "node", a triangular shaped area on the stem. Look for one towards the bottom of the spike and cut the spike ½ inch or so above the node. Sufficient light is important for healthy growth and flower production. The plant requires bright light, but not direct sunlight because they will scorch. In the home an east, west, or shaded southern window will provide adequate light. The foliage should be naturally semi-erect and medium olive green with streaks of red or burgundy on the undersides. If the foliage is dark green and limp, this is an indication of too little light. Mature plants need a 15 to 20 F degree difference between day and night. The plants prefer nights of 60 to 65 degrees, and days of 75 to 85 degrees. Seasonal temperatures are generally 70 degrees in summer and 60 degrees in winter. To induce a flower spike, the plant needs a few cooler nights, down to 55 degrees. The plants will not bloom well without this temperature contrast. Phalaenopsis orchids have a low tolerance for drought. Mature plants should not be left to dry out between watering's. Water your orchid weekly using ice cubes, if you use water, it will drain right through the growing media. Ice cubes will melt slowly and the water will run along the roots where it can be absorbed easily. The higher the humidity, the more important it is to maintain a good air flow around the roots and leaves. The pots that you purchase your orchids in are designed to be self-draining, but empty them after the ice cubes have melted so the roots don't sit in water. Never use water that has been softened by a water softener. In the dry winter house air, placing your orchid on tray of moistened pebbles will help maintain humidity. Fertilize the plant on a regular basis during the summer months. As with container planting, fertilizer is frequently added because watering drains any media of its nutrients. Use a balanced water-soluble fertilizer at half the recommended strength. Some growers like to give the plant a boost of blooming fertilizer in September or October to initiate a flower spike. Orchids are planted in growing medium that has lots of air space, such as chunks of bark. Re-potting should be done about every one or two years before the mix breaks down too far. It is best done in late spring after the main flowering season. Select the pot size for root mass and not top size. They can also be grown in well drained hanging baskets. Phalaenopsis typically bloom in the late winter or early spring. Their long-lasting flowers grow on arching branches and open successively. A single multi-branching flower spike can have more than 20 flowers. To induce a flower spike, the plant needs a few cooler nights, down to 55 degrees. The plants will not bloom well without this temperature contrast. When the last flower drops, cut your flower spike halfway down the stem. Continue caring for it and wait for it to re-bloom. Phalaenopsis orchids are generally very rewarding plants. It is vitally important, however, that water never be allowed to rest in the growing tip of the plant. This will cause the new leaves to rot, and the plant will die. Thus, they should only be watered in the morning. As with all orchids, the higher the humidity and temperature, the greater the need for air flow to prevent rot, fungus, and diseases. Successful growth means finding the right balance between humidity, temperature, light, and air flow. Phalaenopsis Orchids should be monitored for the typical houseplant pests such as aphids, mealy bugs, mites, scale, and slugs. These can usually be removed with a soft cloth and soapy water. If you choose to use a commercial pest control product, be sure to follow all label instructions. The folks at "Just Add Ice" orchids, who are responsible for most of the Phalaenopsis orchids you will find for sale in the Midwest, have an excellent series of orchid care videos on their website.